Whenever a new Disney Channel Original Movie #blesses us kids (and kids at heart), we pretty much always geek out over the song-and-dance numbers. 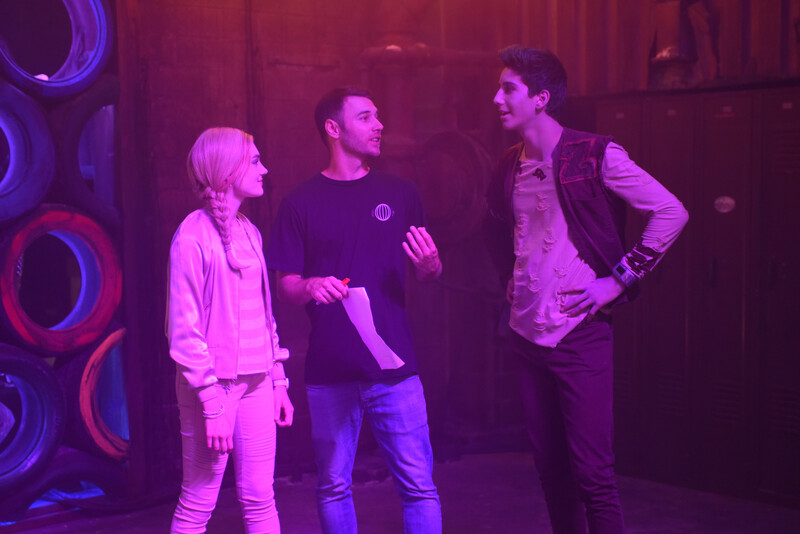 That’s definitely true with the latest DCOM, Zombies, which tells the love story between aspiring cheerleader Addison (Meg Donnelly) and her zombie crush Zed (Milo Manheim), who is able to roam amongst the living with his fellow undead, thanks to new tech that keeps him from, you know, eating the living. In Zombies, one of the standout performances that’ll have you going, “How the heck did they do that?! That is so cool!” arrives via “BAMM.” Zed takes Addison to a zombie party (celebrating his recent football success) and shows her what being a zombie is all about — like, super sick dance moves, mixed with a the crazy catchy song to match, of course. Here to talk us through how “BAMM” came together — intel we’re, let’s be honest, definitely going to keep in mind as we watch and re-watch (and re-watch) Zombies — are Donnelly and Manheim, along with choreographer Chris Scott. HelloGiggles: What was your general approach to the choreography? Was there a type of style that you wanted to bring to the zombies and the human kids? Then, with the zombies, their whole lifestyle was just about being comfortable in their skin and who they are, and just being creative with what they have. So that’s why, for the zombies, we ended up using a lot of props and fun things that we kinda just started finding around the studio and on the internet. We would literally find fun things in our world and we made them zombified. HG: How did you want to bring the two groups together through dance, and fuse those styles? CS: There was something really cool about the cheer element being like a bridge, because it has an acrobatic element. With the zombies, we created this supernatural, anti-gravity almost vibe [especially with “BAMM.”] So bringing those worlds together was really fun, and kind of pushed us to have the spring floor at the end, so you can have some high-flying movement that brought them all together. We wanted to showcase the fusion — which is something I’ve actually done pretty much all [throughout my] career is fuse styles — so I loved the chance and I jumped at it. Putting in Zed with the pom-poms was a moment, symbolically; you want to see him in the cheer world. And then seeing Bucky [Trevor Tordjman] slipping in with the other zombies was a really a cool moment for me. HG: Speaking of “BAMM” and high-flying movement, were those trampolines the kids were dancing on?! What was it like bringing that routine together? The director [Paul Hoen] was like, “We have to do something that makes them feel super human. But we also don’t have a lot of time and a lot of resources to go into rigging or anything like that. So what do we have?” And it just really jumped out at me. “We gotta use this AirTrack.” I’ve been wanting to do a number on this for a long time, so I’m glad I’ve waited up till now. But, it’s not easy, actually. We ordered it, got it in and then had a huge challenge because we couldn’t do anything on it that I was thinking. Nobody could do it. I had a whole other version of the routine on the AirTrack. It didn’t pay off the air track enough. It was just hard cause the dances that are on time are actually a lot harder than they look. Then, Milo got on the thing for the first time and I was telling him to do what we’re going for and he literally jumped up as high as he could, slammed down on his back and popped right back up and was perfectly fine. He was like, “Yeah, I do stuff like this all the time.” I’m like, “Perfect.” So we redeveloped the number. We ended up helping teach the other dancers how to do it, how to jump to your back and with the right technique, to be able to send yourself back to your feet. It was really incredible. It was one of my favorite moments in the rehearsal process. HG: What was your dance training before Zombies, and what was the hardest dance to learn? 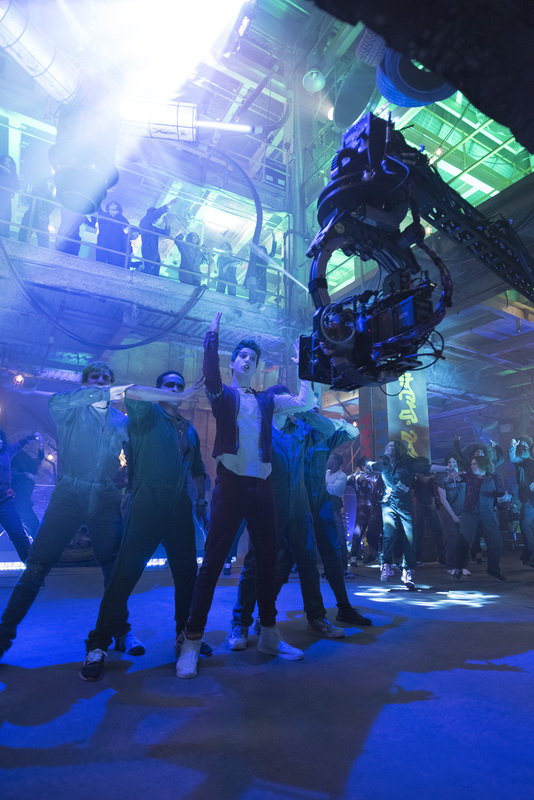 Milo Manheim: Prior to Zombies, I had no formal dance training. I performed in over 20 musicals and learned a few dance moves from different directors and choreographers. As for the hardest dance to learn in Zombies, it was definitely “BAMM,” because it took me the most time to perfect. It was hard to sing the intricate lyrics and do all the stylized dance moves simultaneously. HG: What’s your favorite dance routine from the movie, or even favorite dance move? MM: My favorite dance routine was “BAMM,” but I really loved dancing with the lamp in “Someday!” It was so cool and I think it added a nice touch to the song. HG: For BAMM, what was the experience like of dancing on the AirTrack? Did it make it any easier for the dance? Was there a lot of jumping around in-between takes? MM: Initially, we weren’t using any kind of bounce in the floor. When Christopher found out that I could do back flips, he decided to incorporate that into the dance. We started experimenting with all kinds of jumps and flips and acrobatics. That’s when he decided to get an AirTrack and he re-choreographed the whole dance to include all the bouncy choreography. I would’ve never been able to fall on my back and get back up without it. So, don’t try this at home unless you have a 30 foot AirTrack. 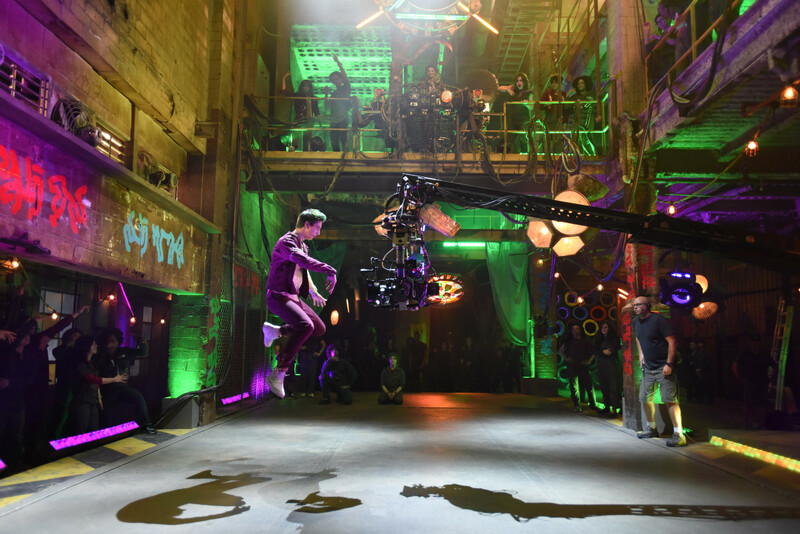 As for jumping around in between takes…It’s totally tempting but you kind of had to be careful, because if you bounced too high, someone who wasn’t paying attention could fall down. 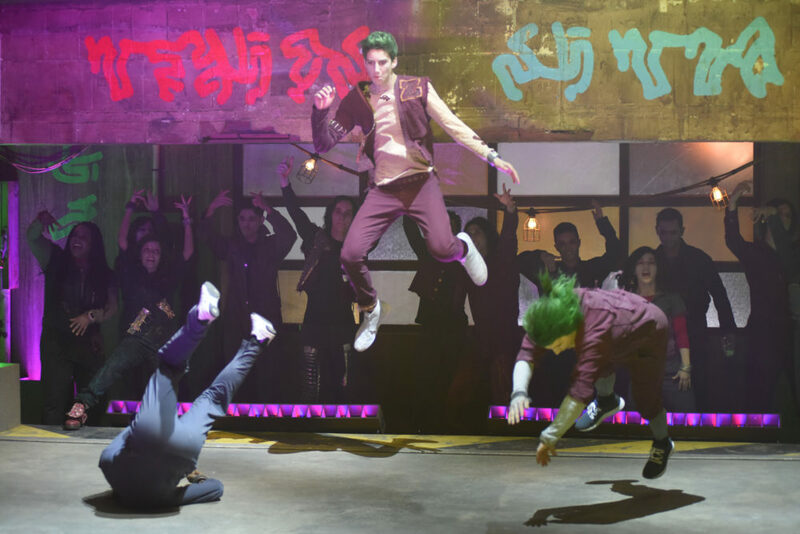 Meg Donnelly: It was so cool to dance on them. It wasn’t easier or harder — just different. And they created a cool dynamic. We had a ton of fun practicing and bouncing between takes! Zombies premieres on Disney Channel on Friday, February 16th.